Outlook allows you to assign each to object (e-mail, contact, etc.) one or more categories. 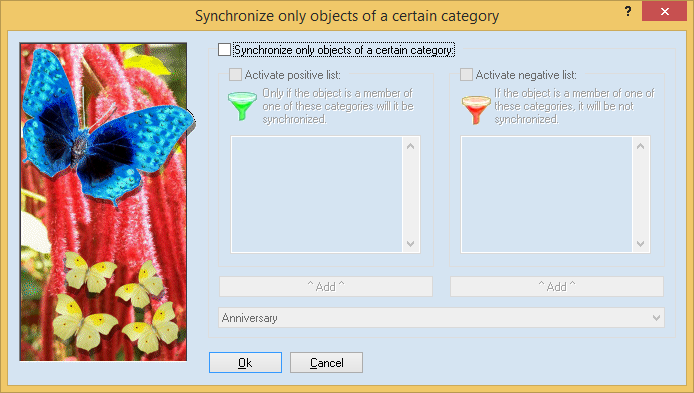 This feature can be useful to filter the synchronization to include or exclude objects. You can enter the desired categories into the positive or negative list (one category per line) or use the buttons to add predefined categories. If an object is a member of at least one of the categories, the filter is triggered (OR condition). If you want the object to be a member of multiple categories for the filter to be triggered (AND condition), you have to enter all these categories into the same line, separated by colons. You can also use the star character ("*") as wildcard at the beginning or end of a category name. Note: Sometimes you may want to use the category filter only for calendar items. To achieve this effect, create two tasks. The first one should synchronize everything but calendar items (type filter) and the second one should only synchronize calendar items and use the category filter.